Authentically scuffed Pebble Time: model’s own. Depending on who you believe, the wearables revolution is underway, has not yet started, or has already failed. While I don’t wholly agree with any of those viewpoints, the fact that I’m now on my second smartwatch does suggest that I don’t agree with the last. Those who follow this blog and are aware of my devotion to the Cult of Mac may be surprised to learn that my new toy isn’t an Apple Watch. 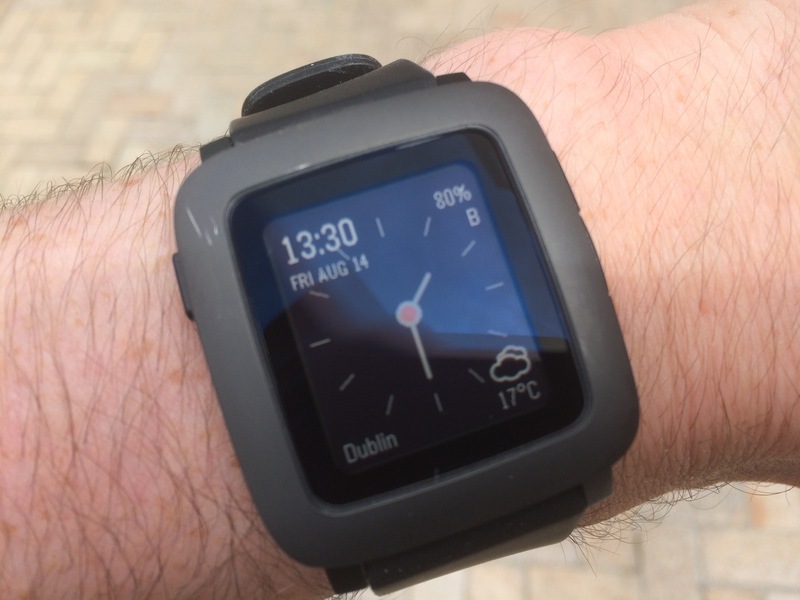 Those who follow this blog in slightly closer detail might be able to guess what it is: a Pebble Time. Several years ago, in one of my early Kickstarter forays, I stumped up for a first-generation Pebble smartwatch, which adorned my wrist for all of a month or two. Its short lifespan wasn’t down to the fact that it was a bad product. Beyond being a first-generation device (part of my reason for eschewing the Apple option this time) with somewhat dodgy Bluetooth wireless and limited functionality, its only major flaw was that it was uncomfortable to wear for long periods of time. Unfortunately, that’s also why it was in my pocket instead of on my wrist during a fateful bus journey, and the fact that it fell out of the pocket somewhere was entirely my fault, not the watch’s. But enough of my ongoing habit of losing things (which seems to come in waves – whenever I lose one thing, I known that at least two more will vanish in the short-term future), what of the Pebble Time? Well, the first thing to note is that it’s much more comfortable to wear, with a slightly curved back to the watch body and a much improved rubber strap. While I’ve had to take it off for comfort reasons a few times, this has been the result of sweating due to exertion, not general day-to-day use. So score one for the Pebble Time there. In addition, the straps now include easy-release clips that, while not as clever as the Apple Watch’s high-end version, allow access to a full range of standard-gauge watch straps. In fact, the Pebble Time is a solid version 2.0 in a lot of ways. A colour e-ink screen replaces its monochrome predecessor, the Bluetooth connection seems much more solid, the vibration function is hard to miss, and the build quality overall seems much better, with buttons that avoid feeling too spongy despite being plastic. My gunmetal grey version has picked up a few scratches after a month or two of use, but stumping up a little more money for the Pebble Time Steel could gain you an even more polished experience. In use, the Pebble Time is easy to figure out. Hit the single button on the left of the watch to navigate backwards to the home (watchface) screen. Hit the centre right button to dive into and select menu options and the buttons above and below it to navigate up and down through lists. Changing settings, accessing apps, changing watchfaces, etc. are trivial tasks. To actually install apps or watchfaces, you’ll need the companion smartphone app, but once installed, they can connect to the phone via a Bluetooth connection for extra processing power. Pebble’s own app store, accessible via the smartphone app, makes installing new apps easy, but finding the app you want can be tricky, as the browsing experience feels a little haphazard. As with any smartwatch, the Pebble Time is reliant on its connection to a smartphone. Lacking that, it can tell you the time and offer access to any standalone apps that you’ve installed, and not much more. A connected smartphone offers instant access to weather, music, and more advanced apps. For example, I’ve installed the Tripadvisor app, which can point me towards nearby restaurants or attractions, should I so desire. It’s limited, but the interface is responsive and fun to use. In fact, fun is a good description of the Pebble Time overall. The Pebble team seem to have put a lot of thought into making their device as easy to use and enjoyable to own as possible. For example, there’s no need to install an app to use the Pebble Time as an external display for Runkeeper’s smartphone app—it happens automatically. This good user experience is further helped by the Pebble Time’s battery life, which will stretch out to five days. Changing your watchface to one that displays the battery level will help you keep an eye on that, but it’s far ahead of the Apple or Android watches in this regard at least. Some commentators have raised concerns that transferring notification from the phone to the wrist just makes us even more tied to that “always on” mentality. The reality has proven very different: an initial flood of notifications trained me to turn off any that weren’t vital. Moreover, even though vibrations on your wrist make notifications hard to miss, it’s it’s far quicker and easier to dismiss those notifications by glancing at summaries of them on a watchface than by digging your phone out of your pocket or purse to see what they are. Yes, notifications probably aren’t wholly a good thing, but if you’re going to opt in, this is the way to go. I haven’t tested the limits of what I can do with the Pebble Time yet, having only installed a couple of apps and watchfaces. Though far less powerful than the Apple Watch or its Android competitors, the Pebble Time offers plenty of variety in terms of what it can already do. Everything that I have experienced with it so far has made me pretty happy with my purchase. The cluttered app store is the only minor fly in the ointment, whereas everything else is pleasingly smooth.